A friend recently asked if I ever cook any of the recipes I find on Pinterest. Many of the recipes I make once and never again. Several have even made it here to Idiot’s Kitchen. 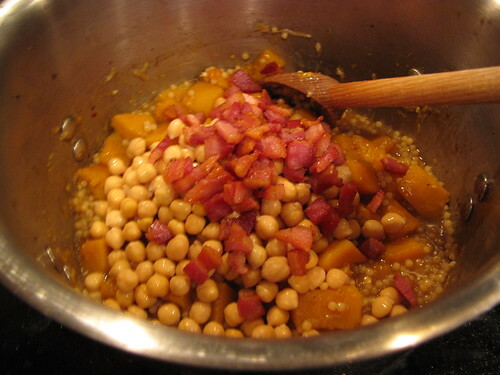 However, this recipe for Couscous with Butternut Squash & Pancetta should win some sort of Pinterest inspired award. I have made it at least 4 times including once in back to back weeks. Sometimes you can just look at the ingredients and know that you’re going to love it. That’s the case here. 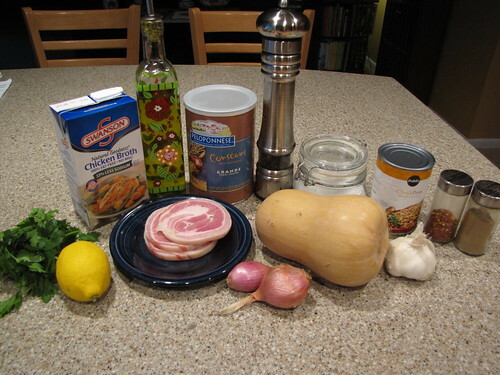 Pretty hard to go wrong with Pancetta (Italy’s version of bacon) and Butternut Squash. As a bonus, this highly versatile dish can be served as the main entree, a side dish (I’ve served it with both salmon and grilled chicken), or as a salad. It’s equally delicious served hot or cold. 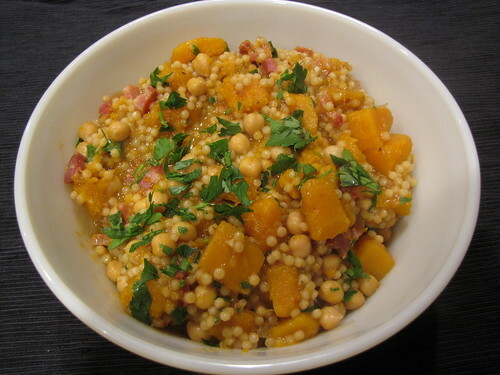 Butternut Squash, Pancetta, Shallots, Garlic, Lemon, Parsley (or Cilantro), Chick Peas, Pearled Couscous, Chicken Broth, Olive Oil, Cumin, Red Pepper Flakes, Salt & Pepper. The most difficult part of making this dish is peeling and cutting up the squash. I’ve yet to find a secret method for this task except to say that investing in a Good Vegetable Peeler with a nice cushy handle is key. Cut the top or stem end off the squash remove the skin down to the bright orange flesh. You might have to take a few extra swipes with the peeler once you have the outer hard rind removed to get to the really nice part of the squash. 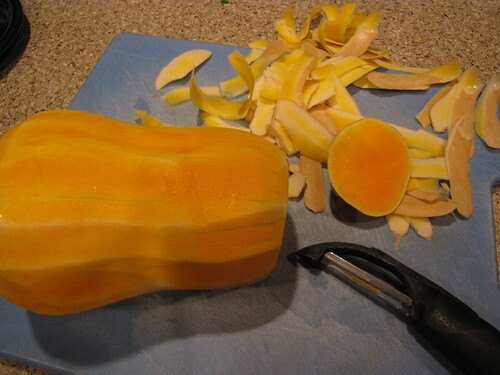 Then with a sharp knife and a fair amount of muscle, cut the squash in half vertically. Use a big spoon to scoop out the seeds, cut it into strips, and then into big, bite-sized cubes. 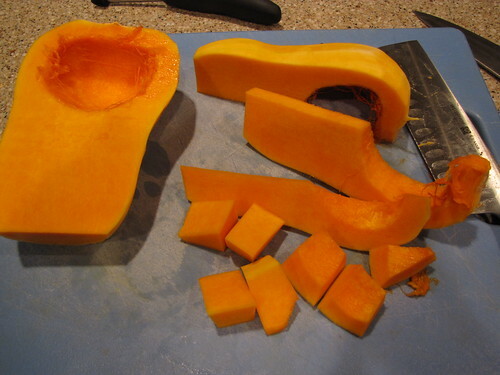 The pieces of squash can be a bit on the larger side. We want them easy enough to eat but not so small that they fall apart into mush while cooking. 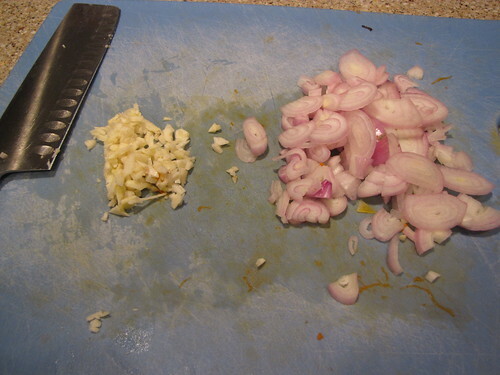 While you’re in the chopping mood, slice up 1 large shallot (about 1/2 cup) and finely mince 2 cloves of garlic. I buy my pancetta right at the deli counter. Tell them you need 3 slices about ½ inch thick. That should roughly equal ¼ pound. 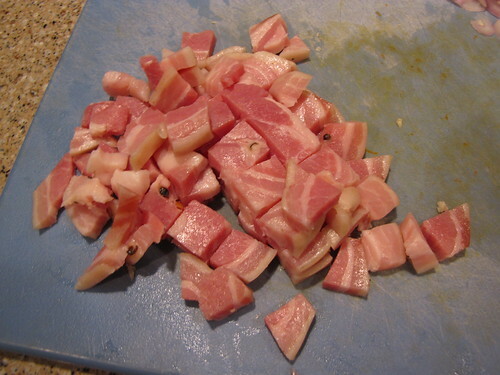 Cut the pancetta into small cubes. Heat 1 Tablespoon of olive oil in a large pot over medium high heat. 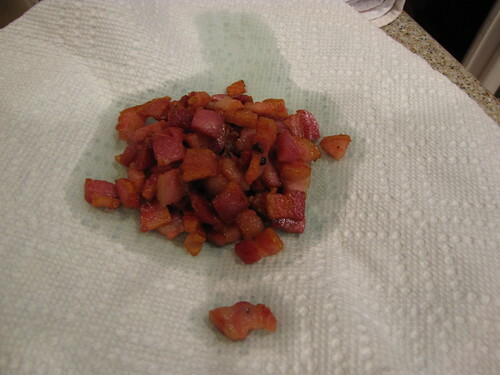 Add the pancetta cubes and cook in the oil until crispy and the fat has rendered off the meat, about 5 minutes. Keep an eye on the pan and lower the heat if the pancetta is getting too brown and crispy before the fat has a chance to render off. 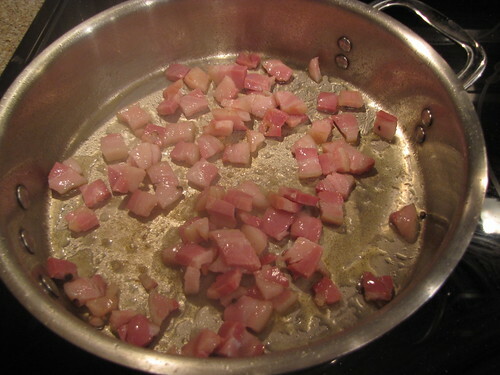 Use a slotted spoon to remove the crispy pancetta from the pan and set it aside. If you are me, you will need to hide the pancetta from yourself to keep from nibbling on it while you cook the rest of the recipe. 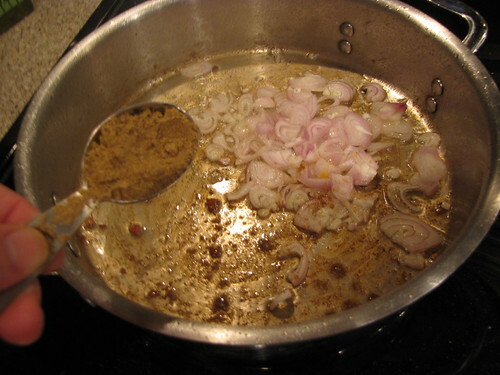 Add 1 large sliced shallot and 2 minced cloves of garlic to the oil and pancetta grease in the pan. Add 1 Tablespoon of ground cumin and a pinch of red pepper flakes to the pan and cook over medium heat for 1-2 minutes until fragrant. 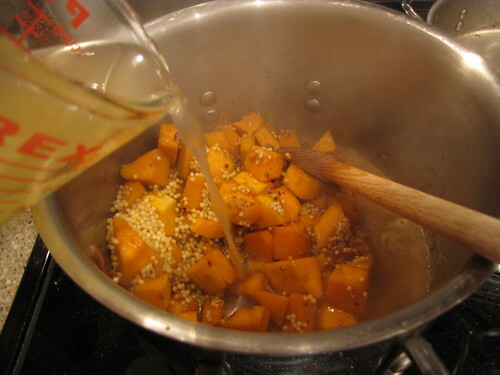 Add the cubes of squash and stir them around the pan to coat them in the oil. 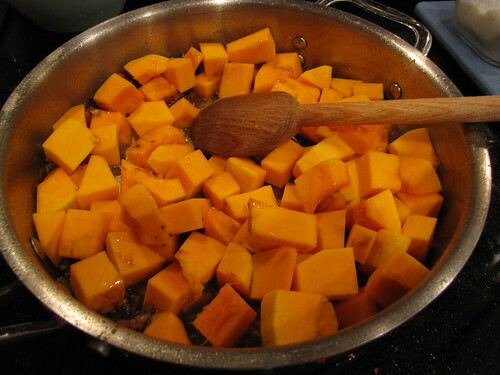 Cook the squash, stirring frequently so it does not stick, for about 5 minutes. 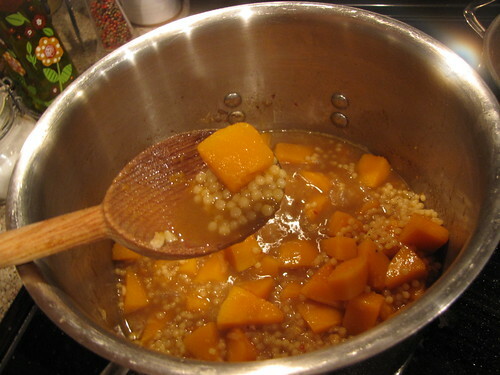 When the squash is just starting to get a little bit of color from the pan, add 3/4 cup of pearled couscous (also called Israeli couscous) to the pot. and bring the pot to a boil. Reduce the heat to low and simmer uncovered, stirring occasionally. 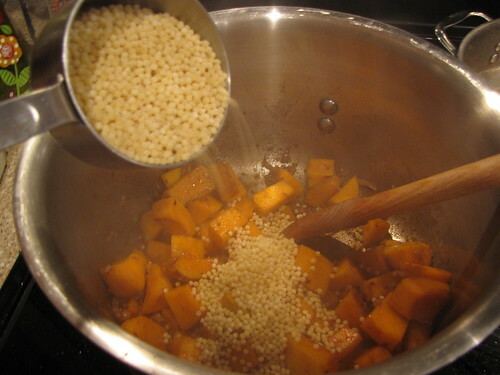 After about 15 minutes, the squash should be fork tender and most of the liquid should have been absorbed by the couscous. Drain and rinse 1 (15 oz) can of chickpeas and add them to the pot. Return the crispy pancetta to the pot and stir to combine. 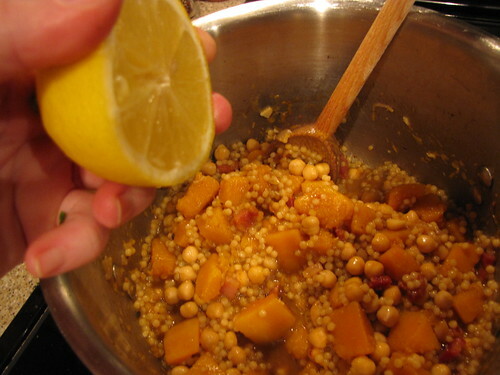 Remove the couscous from the heat and squeeze in the juice from 1 lemon. Taste and season with salt & pepper. Add 1/4 cup of chopped parsley or cilantro (I’ve made it with both) and serve. I think this would be a pretty easy dish to vegan-ize by substituting veggie broth and leaving out the pancetta. Although, I have to say the pancetta is ridiculously good. Thanks to my friend Emily for pinning this one! Now, on to crafts made from wine corks! I thought this one was a winner too when I made it a few months back. Thanks for reminding me of it–I’ll put it on the list to make for dinner next week!